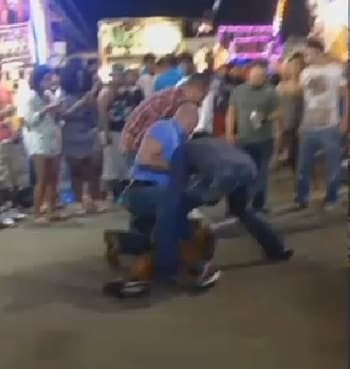 A fight between two men at the Oklahoma State Fair quickly escalated when one of the men pulled out a gun, but thanks to the actions of three men – who are now being called heroic – the situation was contained without any serious injuries. Nikki Schalla was waiting for her kids, who were on a ride at the time, when she witnessed part of the incident, which she recalled during a video chat with local media Wednesday. But before any shots were ever fired, a quick-thinking civilian wrestled the suspect to the ground, then two off-duty Del City police officers, who happened to be in the right place at the right time, stepped in to help and kept the suspect detained until Oklahoma City police officers arrived on the scene. 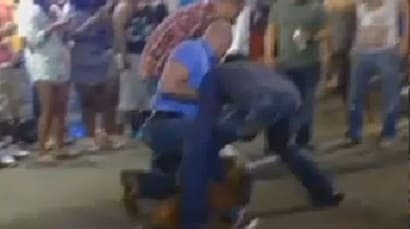 Though a bit blurry, Schalla captured several photos of the tense moments, including one showing the three men subduing the suspect, 19-year-old Otto Reed, who was allegedly armed with a revolver. The name of the civilian who intervened is not known at this time, but the two officers were later identified as Nathan Storts and Chauncey Ward. “We’re very thankful that those officers were there because we don’t know what could have happened. If this guy was going to fire this gun at somebody, kill somebody, we don’t even know why he pulled it,” said Capt. Paco Balderrma with the Oklahoma City Police Department. Reed was arrested and charged for unlawfully carrying a firearm, the second weapon confiscated at the fair so far this year. Oklahoma State Fair policy prohibits weapons of any type, even with a valid concealed carry permit. It is unknown what triggered the fight between the two men.